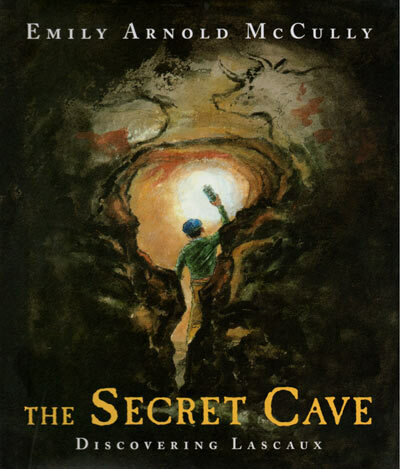 From The Washington Post: "In The Secret Cave, Caldecott Medal-winner Emily Arnold McCully reconstructs this exciting episode through engaging watercolor illustrations that capture the bright beauty of the craggy French countryside, the dank unknown as the boys made their way through narrow underground passages, and the stirring ancient art that the boys' dim lights suddenly revealed." From Kirkus Reviews, STARRED: "Part Hardy Boys, part archeology, this mesmerizing look at the discovery of the prehistoric cave paintings of Lascaux invites today's readers to experience the wonder of the event... The Caldecott winner gets the emotions of the secret descent for buried treasure just right." From School Library Journal, STARRED: "The illustrator copies the cave paintings with a sensitive touch that is somehow both impressionistic and exact, capturing the vitality and gestural grace of each line...A kid-centered approach to a wonderful tale." From Horn Book Magazine: "McCully's own handsome paintings vary from crisply defined characters and events above ground to dark, impressionistic scenes within the cave, where the art and its discovery come dramatically to life. An excellent introduction to this extraordinary site, and to the effect such discoveries have on our understanding of the past." From BCCB: "...a serviceable introduction for young listeners, with luscious watercolor renderings of the cramped, inky passageways vying for oohs and aahs with recreations of the startlingly realistic animal paintings themselves." From Booklist: "McCully's text builds suspense in moment-by-moment descriptions of the boys slithering through narrow, dark, subterranean passageways, but it's the images that have the biggest impact. The dramatically lit, mixed-media scenes evoke both the thrilling exploration and then the astonishing discoveries, reproduced in evocative, textured images."